Home/Blog, Freelance/Freelancers. Who Needs ‘Em? At Unique Web Copy, we work with a number of freelance writers. There are tons of benefits when you work with freelancers — for business owners and for the writers — but we have permanent staff, too. Freelancers can work on their own schedules and from any location, which helps ensure that we’re getting their best work. They’re comfortable, so they produce. If things don’t work out, we haven’t lost much — just the cost of the work they’ve produced. There is no shortage of freelance writers in any niche. If we need help on a real estate project, we’ll find a real estate writer. If we need help on a legal project, we’ll hire a legal writer. Freelance writers are generally more affordable than full-time employees. Freelancers pay their own taxes and are responsible for their own expenses. We can skip straight to hiring professionals who already know what they’re doing. We don’t have to mess around with novices who don’t know how to write. 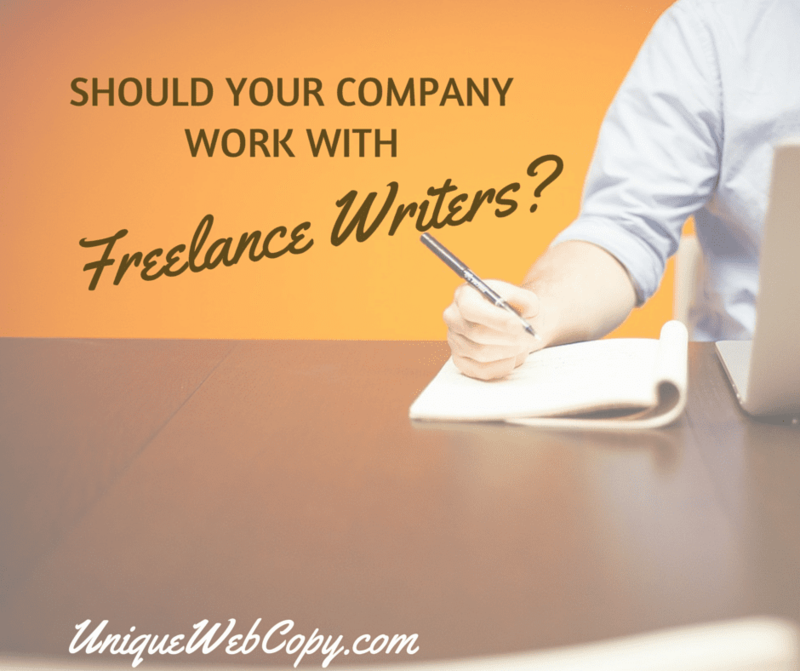 For these same reasons, it makes sense for most businesses to hire freelance writers. Should I Hire a Freelance Writer? Every business is different, but for many business models, hiring a freelance writer is the smart choice. It is for mine, and it’s right for all of the firms who choose to work with us. Because freelancing is not a traditional arrangement (we don’t show up in someone’s office at 9 a.m. and clock out at 5 p.m.) some people are uncomfortable choosing a freelancer. It’s true that you won’t be able to peer over your freelance writer’s shoulder to make sure he or she is working. However, if you’ve done your homework, you’ve checked out the writer’s portfolio to make sure he or she has the talent and skill sets you need on your project. What Happens When Things Don’t Work Out with a Freelance Writer? When things don’t work out with a freelance writer, all you need to do is let him or her know that you’re moving in a different direction. Freelancers aren’t obligated to work for you, and they can stop at any time. The same goes for us; we’re not obligated to continue rehiring the same freelancers over and over. If it doesn’t work out, it doesn’t work out. Everyone moves on. Most experienced freelancers are incredibly professional. This is business, and there are no hard feelings either way. I’ve dealt with my share of unprofessional freelancers over the years, but for the most part, everyone has been gracious and professional. Sometimes a freelancer will be angry with you when you tell them you’re moving in a different direction — some will even go so far as to demand answers — but those very unprofessional freelancers are few and far between. If you hire the right freelance writer, you’ll never have to look for another one anyway. By Angie Papple Johnston|2015-08-11T08:36:55+00:00August 11th, 2014|Blog, Freelance|Comments Off on Freelancers. Who Needs ‘Em?